Option B1 with a protected bikeway and off-peak parking. Image by DDOT. For the first time, the District Department of Transportation (DDOT) is considering adding protected bikeways north of Dupont Circle on Connecticut Avenue. Although the initial scope of the project would end at California Street, this development may get the ball rolling on extending the lane north all the way to the Maryland line. We previously reported on the proposed deck-over portion of this project between Dupont Circle and Q Street. The goal is to create a more fluid, consistent, and safe pedestrian corridor through this heavily trafficked area, provide safe bicycle infrastructure, and create other multimodal transportation options. A followup community meeting on April 26 revealed more detail on streetscape options, and there will be many more meetings to come for those who would like to weigh in. Ultimately, the city wants to create a more vibrant and safe space that will support the local business community and spur economic development. That’s a tall order, but the proposals show a great deal of promise. There are three general concepts proposed for the streetscape. While increasing pedestrian space and improving pedestrian safety is a core component of all three, the main differences relate to bicycle infrastructure and car capacity, as well as active travel and parking lanes. Option A reduces car travel lane width with the goal of decreasing speed and improving safety. It uses the extra space for full-time parking which increases overall vehicle capacity. It does not introduce new or protected bicycle infrastructure at all. Option A: overview and sections along the plan without protected bicycle infrastructure. Image by DDOT. Option B uses the space freed up from the reduced lanes to introduce protected one-way bikeways on opposite sides of Connecticut Avenue. There are two sub-options, B1 and B2, that essentially consider off-peak versus full-time parking respectively. Option B1: overview and sections along the plan with one-way cycletracks on each side of Connecticut Avenue. Option B2 would be very similar except with full-time rather than off-peak parking. Image by DDOT. 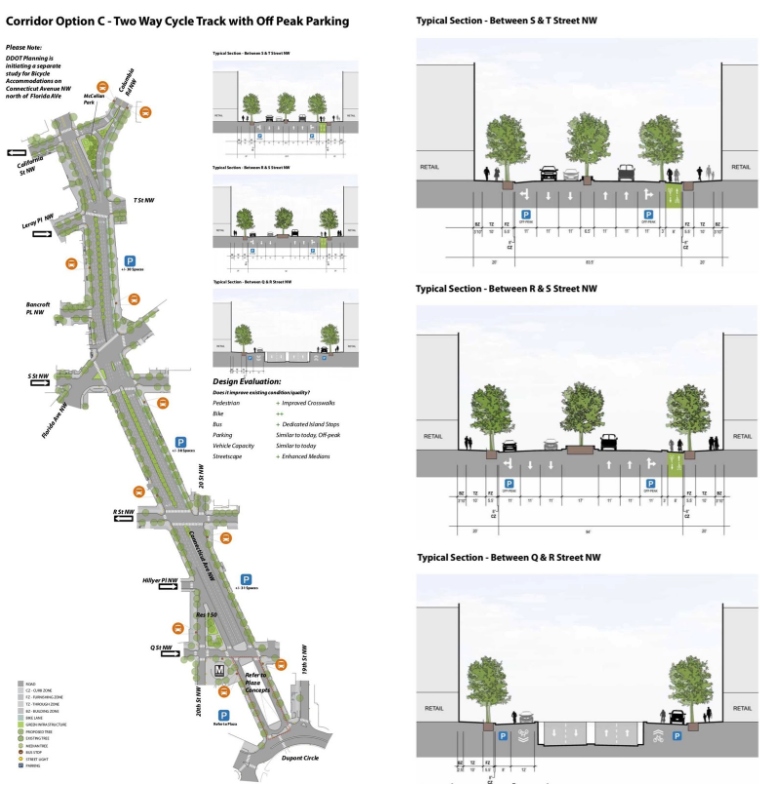 Option C includes a two-way protected bikeway on the east side of Connecticut Avenue with off-peak parking only. 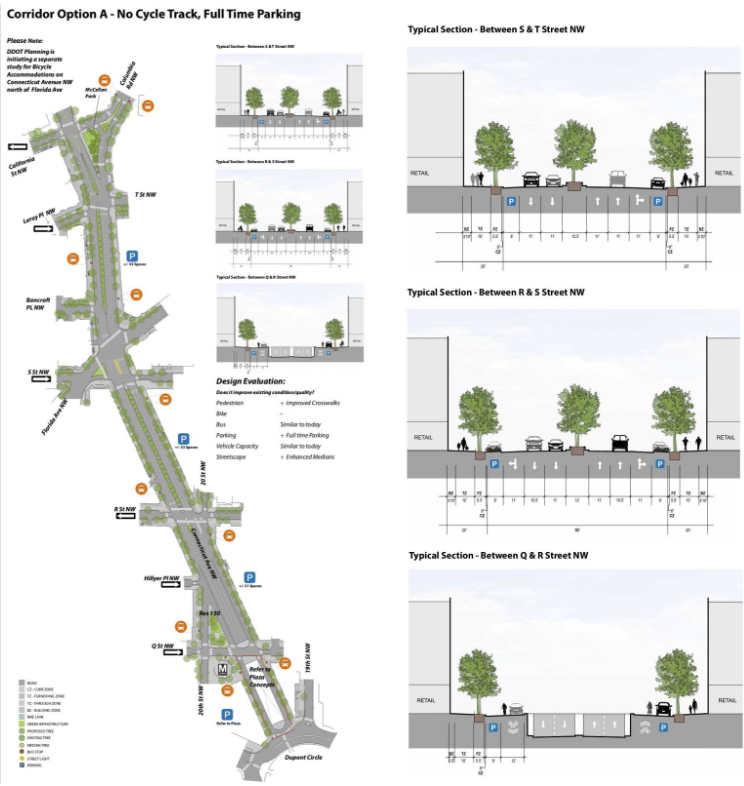 Option C: overview and sections along the plan with two-way protected bikeway. Image by DDOT. Based on DDOT comments and reactions from those in attendance, it seems that the focus will be on choosing between and refining the best elements of Options B or C. That being said, DDOT seemed hesitant to make the area less convenient for drivers even though reducing capacity for cars and expanding infrastructure for other modes is an explicit goal of moveDC, the city's transportation plan. Some of the proposals are bit at odds with DDOT's goals. It will be difficult to reduce congestion, decrease pollution, and align with the moveDC plan while keeping the capacity for cars the same. Sacrificing some of the lanes and/or the approximately 100 parking spots in the area in order to introduce new protected bicycle and pedestrian infrastructure seems in line with both the moveDC plan and Vision Zero. 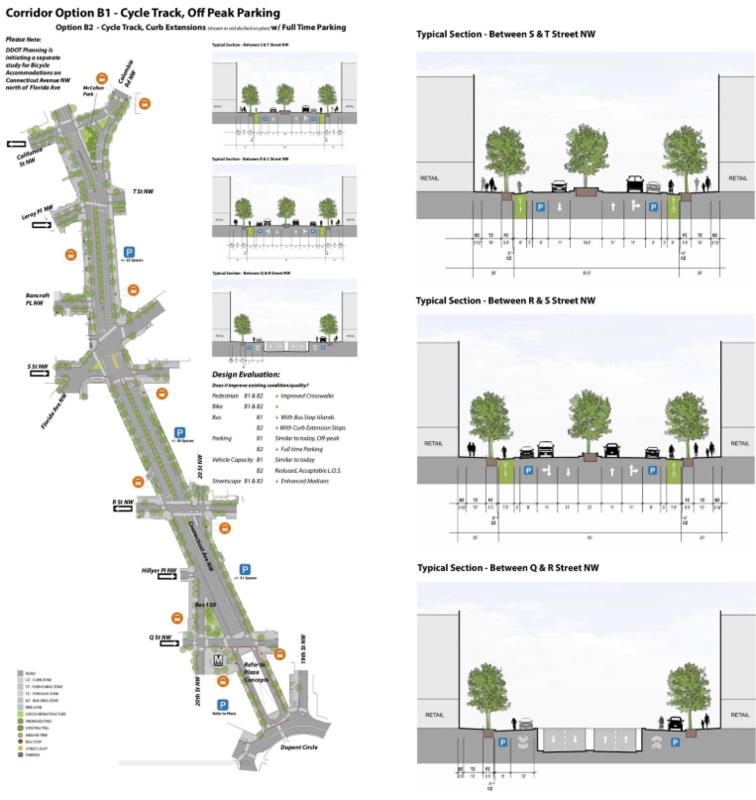 When choosing the best alternative, we should also consider how this project can link into future developments, in particular other moveDC recommendations for the rest of Connecticut Avenue. As part of the moveDC Proposed Bicycle Network, a cycletrack on Connecticut Avenue should be considered all the way from Farragut Square to the northwest DC boundary at Western Avenue. MoveDC Bicycle Element recommends a protected bikeway (identified as purple dashed line) along Connecticut Avenue from Farragut Square to Western Avenue. Image by moveDC. Image used with permission. DDOT has yet to study how this plan would be implemented — the next step would be to get budget authorization to hire a consultant to perform a detailed study, something a number of advocates are pushing for. There could be some challenges in bike lane alignment heading north from California Street across the Taft Bridge, but there are creative solutions that could involve using reversible driving lanes on the bridge in order to fit a protected bikeway. Another option is to expand the sidewalks, with one side devoted solely to bikes and the other side maintained for pedestrians. Decisions made on the current project will have a major influence on future designs heading north. For example, if a two-way cycletrack on one side of Connecticut Avenue would be more viable further north, option C would be the logical choice to help ensure a smooth connection to future bicycle infrastructure. 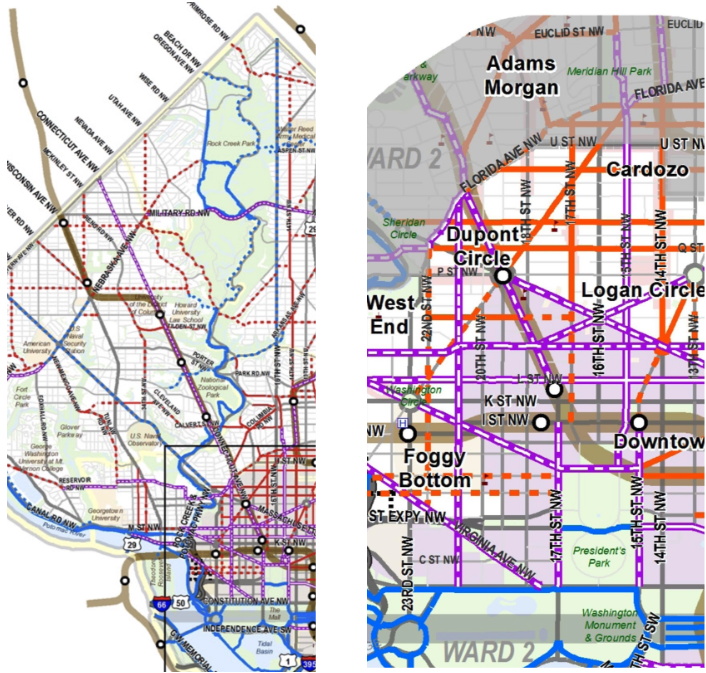 For purposes of safety, congestion, pollution, and to adhere most fully to the moveDC plan, options B1 or C seem best. DDOT should consider how to connect to a potential full-length Connecticut Avenue cycletrack, and not be afraid to reduce space for cars in order to do so. Full plans and presentation material can be seen here. DDOT is also accepting comments until May 21 here or by email, so be sure to weigh in!